...would you expect either of these to stop here? ...yeah, me neither. It seems reasonable to expect capital flight to continue. "In its statement, the People’s Bank of China said it would let markets play a greater role in setting the currency. The first test of that will come Wednesday morning at 9:30 a.m. in Beijing when it sets the daily fix. If the central bank follows the market, the currency could fall another 2%. Bets on the yuan in the options markets signaled investors rising expectations for a weaker and more volatile yuan in the coming weeks. " For all the talk of slow markets and hammocks there sure is a lot going on. I like it, let markets play a greater role when you know markets will push hard in the direction you want. Looks like that Apply and Dax call was right. 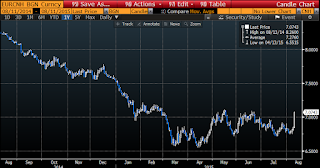 Saxo Bank called for a 20 percent devaluation at the beginning of 2015. BRICS bar india in the shitter. MENA in the shitter with oil & war. Miners, CAD & AUS suffering due to commodities and EM slowdown. Greece. The whole cheap euro export expectations has unravel potential. Peripheral Europe on the up from a low base. US old school stocks in a bother, but we've got burger joints, iphones & social media. If you were Chinese..you would buy gold! "With the Chinese domestic housing and credit bubble finally correcting, if not imploding, China will be looking for any way it can to ease the enormous deflationary pressures that characterise the downside of a credit cycle. Aggravating the pressure on China to act are almost three consecutive years of producer price deflation driven by massive overcapacity. A Chinese yuan at record highs (in inflation-adjusted terms) in this environment makes no sense, especially in light of its neighbour Japan’s simultaneous record low exchange rate (also in inflation-adjusted terms as of mid-November). So in 2015, China moves rapidly and persistently to devalue its currency over the course of the year, joining Japan and other countries in the global struggle to import inflation. This sets off a chain of Asian devaluations and the risk of hostile trade and financial sanctions with Japan." 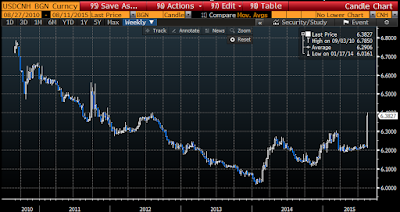 Can the Chinese move be viewed as similar to SNB removing peg before ecb QE. China sees FED moving soon so removes peg? "China's currency fell further Wednesday following a surprise change in its exchange rate mechanism that rattled global markets and threatens to fan trade tensions with the United States and Europe. The central bank said the yuan's 1.9 percent devaluation Tuesday against the U.S. dollar, which was its biggest one-day fall in a decade, was due to changes aimed at making the tightly controlled currency more market-oriented. That raised the prospect of still more declines, which would help struggling Chinese exporters at the expense of foreign competitors and might shore up flagging economic growth. On Wednesday, the yuan dropped another 1.6 percent." How quickly will the herd shift? Or will there be another Bullard moment? What about a 'if you were Swiss' edition? Or better a non-Swiss seeking a safe haven in CHF? Any guesses re USDJPY ? Methinks we will see 130 pretty soon. Seven days to bid the dax up 600 points. Day and a half to erase that. Doesn't sound like a strong bull market. FM, you felt it running out of steam and I suggested shorting it. That was the top. Waiting for ESX to give 3500 a proper run. You gotta love low liquidity August when it gets going. "the nightmare continues for high end real estate bubble spots that lost their Gulf and Russian buyers after oil/RUB took a hit (London), and their south American buyers after EM currencies crapped (Miami) but were still counting on Chinese buyers despise the crack down on corruption. Well China will just be making foreign real estate 2% dearer every day. With Chinese bid dissipating i might finally get Hawaii on the 'cheap'"
Sure nico - now they will be replaced by 25 yr old silicon valley 'entrepreneurs' who came up with a self esteem boosting app that whispers 'oooh, u so fine' which they sold to a private equity fund with a 7% IRR target for a BN. More seriously, the misallocation of capital in the last few years has been colossal, but the bigger point is its there and still quite abundant. Any reason why you wouldn't expect american buyers to purchase property in Europe and Dubai, for example? This isn't a major cause for alarm as yet, not much buying of JPY. It would not be clever if you be long Asian equities, but we're not. It's not as though PBoC is going to do this every night for the rest of the year. Likely outcome of this week's dislocation is more dovishness from the BoJ. If there's one thing that was learned from the crisis of 2008 it is that allowing USD and JPY to firm up at the same time is a bad idea, with the yen carry unwind being, if anything, more dangerous. 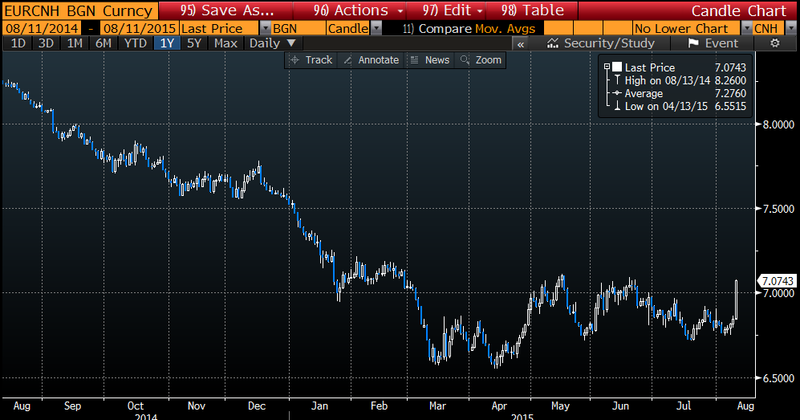 So, yes we may see USDJPY break out to new highs later this month align with a Silly Season rally. For a trade, given that CNY devaluation may not be quite done, we'd be looking at long DAX, short Treasuries, maybe take another look at Aussie stocks for a few bargains? Just watching for the time being, and US equities remain fundamentally unappealing. AAPL in danger of filling that gap down to below 110. Dudley to give a Bullard moment? anon 1:29 - sure - spoos are down almost 15 points and horror of horrors, below the 150 day and almost flat for the year - the stench of human suffering is intolerable. Dudley is currently hastily editing his remarks to take out data dependency and throw in oblique QE4 references - his most recent google searches were for smily emoticons and .gifs of doves flying. Dax is the whipping boy here considering the amount of China trade with Germany but its probably the bulk commodity guys who should be most worried, not the higher end exports of zee germans.. yet AUD and CAD have already reversed losses so I am a little lost. Marking reaction to the 2% move is pure sentiment as you would expect during the summer lull. Interesting to see if this might be positive for Chinese growth of if the trend continues. Not so positive on rebalancing the economy. Agree theres value in Australia. Just stay away from thr banks. Miners taken out to the woodshed. 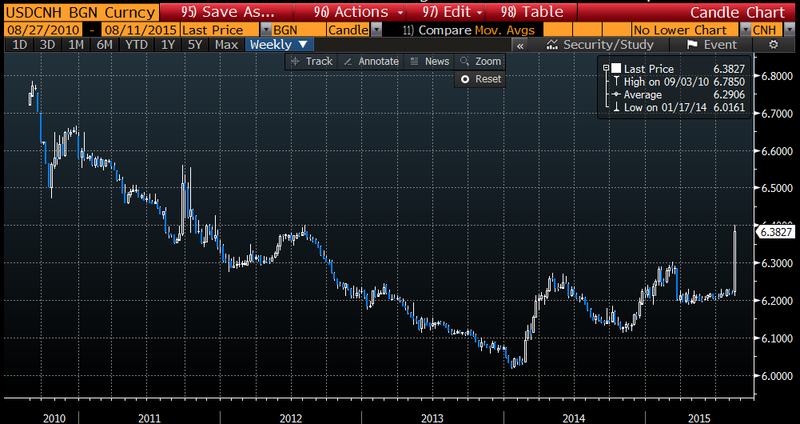 Price action in glencore shows balance sheet still king. Abee washed-up to be honest i do not know much about real estate but sentiment extremes - on the euphoria side - are quite similar to stock markets . In 2006 going out in Miami all you could hear from yes, taxi drivers, club bouncers etc was the millions they made flipping condos, that prices would never go down because of land being limited and demographics and stuff all the while you could read that folks were 'renting' good credit to get access to mortgage. Wtf. a bit now... the fact that PBOC is trying to intervene to also slow down the decline at least suggests the possibility as plausible that it might not in fact be a beginning of a deliberate "strategic currency war" as the consensus majority seems to be suggesting, rather it's just because of still inexperienced and immature CB policy planning toddling along. And it's notable that nobody seems to believe in the Sep hike anymore either which is supposedly torpedoed under the waterline now, and it certainly shows in currencies. Here's an alternative theory on EURUSD though. Perhaps a DAX relief tommorrow as the underlying reason somewhat reverting (so consequence should too), but at times it's possible that when something acts as a trigger it then ceases to be an underlying reason. Nico, its much easier to look at the busts in Miami and Dubai than to look at the other cases in Sydney, Vancouver, London, NYC which have pretty much seen straight appreciation for the past 20 years, barring a few short corrections. I am not saying those places arent over-valued, just saying they have been expensive for a long, long time, so perhaps we need to analyze their prices within a different model. MLP buyers on strike, HY closed for summer...Mr Equity market?? New York is building those needle skyscrapers. A tale of greed and maximum return, they would build them 5 miles high if technology allowed so..
A townhouse in London was bought by a Chinese family for 20 million quid some years ago. Sold the the daughter of the former prime minister of Ukraine (oh really?) for 50 millions some years later. Now on sale for 85 millions. You get the drift? I think London has gone completely insane but a fabulous playground if you have the know how to refurbish prime old stuff and sell it to the new riches. August 26, 2015 at 2:34 PM × This comment has been removed by a blog administrator.